Ikea electronics - no Allen key required! Ikea electronics – no Allen key required! I’ve mentioned my unwavering love of Ikea to you all before, so I won’t deny that I’m very excited by the introduction of electronic products. I love that we can now have these ‘mod-cons’ with the (often unbeatable) Ikea price tag! First up is the Ikea Patrull Air Purifier which looks great in sleek black and white and not at all imposing like many others on the market. We’ve mentioned other air purifiers that are less ‘run of the mill’ before, such as the Andrea Purifier and the AirPod, so we’re more than willing to add the Ikea Patrull version to the ranks. 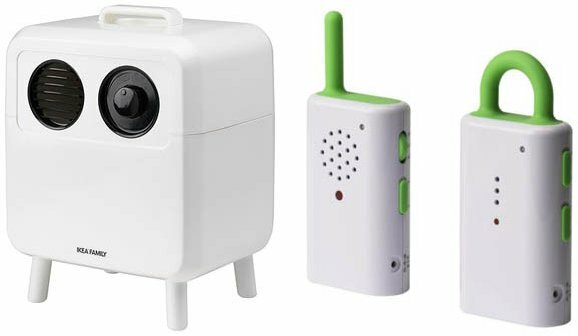 The other new product is the Ikea Patrull Baby Monitor. No bells and whistles here readers, just a straightforward, easy to understand, battery operated monitor. You still have two channels, volume control and the ability to turn it on and off, just all in a no fuss Ikea fashion. Neither of these products are available as yet in Australia, we can only hope to see them arrive on our shores soon. After all, it doesn’t get much easier than Ikea!